TAEKWONDO jins from A. Diasnes Taekwondo Gym took the overall championship during the 3rd Capiztahan Taekwondo Championships over the weekend at Robinsons Place in Roxas City. Finishing with gold in individual poomsae were Mariel Angela Siscar, Art Josh Ramos, Airon Melvin Aguana, Seth Ryan Templaza, Lansil Andrew Brotalo, Ashley Dello, Aryan Nonis, Margareth Aguana and Heleana Grace. 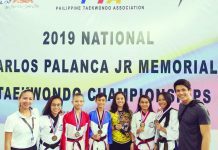 Taking home silver in individual poomsae were Exiovince Albor, Kristie Marie Siscar, Jasmine Badoles, Artha Tanagon, Cloud Aquino and Jan Gancero, while winning bronze were Kyle Chin, Ma. Krizzel Balofinos, and Xandrew Refugio. 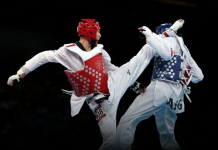 Winning gold medals in team poomsae were the squad of Nonis, Airon Aguana and Tanagon and the trio of Margareth Aguana, Badoles and Dello; silver medallist were Siscar, Aquino and Gancero and bronze winners were trio of Refugio, Templaza and Chin and Balofinos, Siscar, and Brotarlo. Capturing golds in kyorugi for A. Diasnes group were Kyle Chin, Klyzsa China, Balofinos, Mariel Siscar, Kristie Siscar, Joff Silverio, Chzarina Morris, Zeth Rico, Cy Aldous Espinosa, Klieven Palma, Harish Sakhti, Rufino Barrato, Karl Tanagon and Nonis. Bagging kyorugi silver were Ashley Dello, Hannah Dello, Refugio, Gancero, Jesus Ray Opena, John Gabriel Tungla, Artha Tanagon, Arth Tanagon, Art Ramos, Krizz Villan, Cloud Aquino, Ehyan Talabucon, Heleana Donton and MJ Aspera, while bronze winners were Justine Diasnes and Johnniel Cabaraca.